Whether you're getting in the car and heading up to Lake Tahoe for skiing or snow play or just hanging around the house for the holiday break, you'll find plenty of fun things to do with the kids during their time off! Here's our list of 12 fun family activities and outings in Marin and beyond for mid-winter break. Take a family road trip to the Monterey Bay Aquarium and Pacific Grove. Go have some wintertime fun and ski or play in the snow. Celebrate the Year of the Pig at the Bay Area Discovery Museum's Chinese New Year bash. Get hands-on at a fun Bay Area museum. 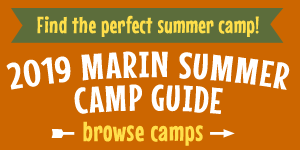 Join a Nature for Kids hike with Marin Parks naturalist at Indian Valley in Novato. Explore the Nature Area and Little Farm at Berkeley's Tilden Park. Go for a ride on a classic carousel in the Bay Area. Enjoy a winter hike at Jack London State Historic Park in Glen Ellen. Take the SMART train to Santa Rosa and go skating at Snoopy's Home Ice (check out the Charles M. Schulz Museum across the street for even more fun). Hit the road and visit the Wizarding World of Harry Potter at Universal Studios Hollywood. Explore Point Reyes National Seashore and West Marin. Take the kids on an unforgettable train ride in the Bay Area and beyond. If you're looking for more things to do, make sure you check out our calendar listings for plenty of family fun events.